My day started at 6:30 am with a walk around Lake Merritt. Other walkers and joggers were already on the path around the lake and a number of people in small boats were sculling in the water. Canada geese and other water fowl were in abundance as well. 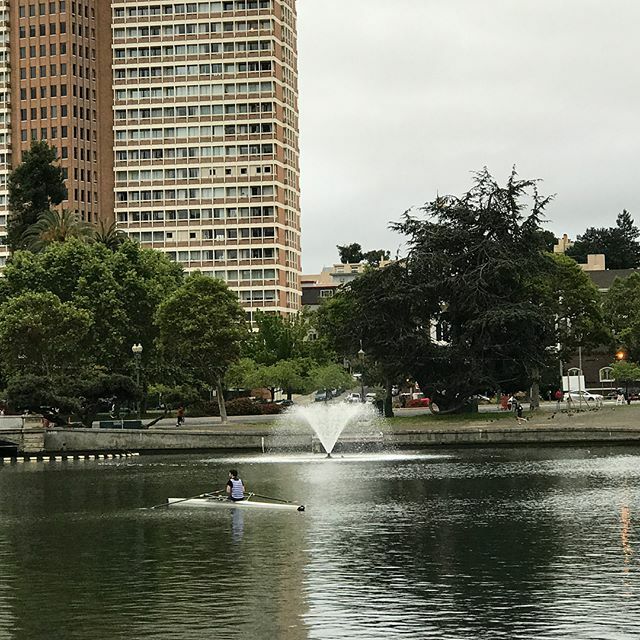 When I moved from San Francisco to Oakland in 1970 I lived a block from Lake Merritt. It’s actually a large tidal lagoon in the center of the city. I only lived there two years—we moved to a different neighborhood while I attended grad school at UC Berkeley. After graduating in 1976 we moved to Maryland where I had a job offer. After returning to California in 1983 with Sharon, we lived in the Oakland Hills for 26 years. But 7 years ago we downsized to an apartment overlooking the lake and went from a Walk Score of 13 to a score of 92! Lake Merritt is historically significant as the United States’ first official wildlife refuge, designated in 1870. The lake features grassy shores; bird refuge islands; the Rotary Nature Center; a boating center; and Children’s Fairyland, a popular fairy tale themed amusement park. There’s also a band shell, and some of my compositions have been performed there during the summer concert series. The circumference of the lake is 3.4 miles, and features a walking/jogging path along its perimeter. Dr. Samuel Merritt, an early mayor of Oakland, was instrumental in getting the water cleaned up. The tidal lagoon was turned into a lake and sewage was redirected elsewhere. The resulting body of water was later named after him. Our bedroom has an eastern exposure & the sun streams into our bedroom at sunrise. After reading the Daf Yomi (the Talmud portion for the day) in English, I took the walk around the lake, then ate breakfast (steel cut oatmeal, fruit, nuts), and worked out (the usual: pull-ups, squats, pushups, planks). Then I had a protein shake (frozen banana, strawberries, frozen mangoes, OJ, water, protein powder), wrote a letter (using a Pelikan fountain pen) and had lunch. After a trip to Costco I practiced the flute (today was brought to you by the keys of B & G#m). We’re watching Season 1 of “Bosch,” based on Michael Connelly’s novels; I’d recommend it. Hope you enjoyed your day!